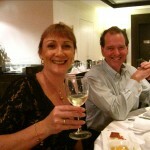 The versatility of Misha’s Vineyard 2009 “Dress Circle” Pinot Gris was on show at The Pines Club in Singapore on Friday evening 21st May where was it was matched with 3 courses of a Chef’s Lok Lok night menu served to 70 of The Pines members and their guests at the Pine Garden Chinese restaurant. Lok Lok is normally community steamboat style dining, cooking small pieces of food on sticks, however this menu was prepared with the chefs doing the work and matching with some interesting baked elements. The Pine Garden 3 part Combination course was splendid with Sharks Fin wrapped with Egg White, Suckling Pig Skin with Foie Gras sauce and Steamed Prawn with Minced Garlic. The off-dry style of the Misha’s Vineyard “Dress Circle” Pinot Gris complimented the delicate flavours of the seafood, and the citrus acid finish freshened the palate after more oily texture of the Foie Gras and Pig Skin. The second course was a cleverly prepared mix of Minced Australian Scallop and Minced Shrimp formed into two small fish designs swimming in a pond of Supreme Stock. The hints of Pink Grapefruit and long palate of the Pinot Gris melded superbly with the shellfish and crustacean mince and enhanced the flavours of the stock. The last course paired with the Misha’s Vineyard “Dress Circle” Pinot Gris was a Stewed South African Abalone served with Pigs Trotter (no, not the whole trotter but small boned pieces carefully stewed, pickled and tenderized to compliment the Abalone). The paring was magic! The slightly more pungent elements of this dish bought out the pear essence in the wine and again the acid in the finish left a clean refreshed palate. To match the last course of the evening we served a Misha’s Vineyard 2008 “The High Note” Pinot Noir. The Baked Kurobuta Pork with Fried Rice was an easy match for the savoury and dark fruits of the Pinot Noir and the subtle exotic spices in the wine added to the flavours of the sesame coating and slightly creamy sauce on the pork. 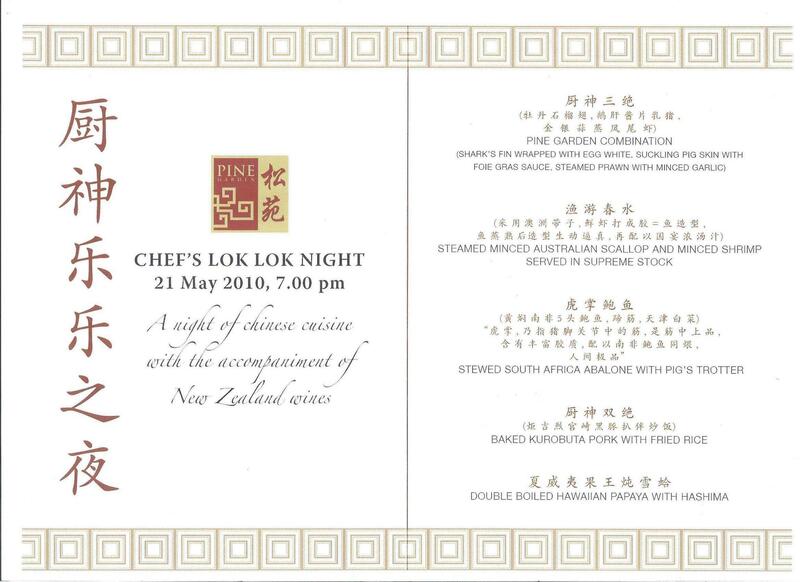 The wine matching across the range of foods worked very well, proving the versatility of Pinot Gris with a wide range of Chinese foods, and the lighter more elegant style of Pinot Noir allowing the flavours of the pork dish to marry with the wine. 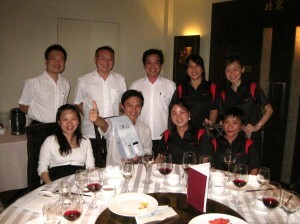 Thanks to David Lim – food and Beverage Director at The Pines for arranging this wonderful event.